Highback and comfortable dining chair in Italian fiore leather. This successful dining chair is now offered in primo fiore leather. Here pictured in a soft midcentury sage green. Very difficult to picture It correspond to PANTONE 7493 C, that is called Reynolda green. From the tiles of Reynolda house. This highback dining armchair can work well matching the regular back one in my listings (pictured in Mountbatten rose). Leather piping around the edge and proud of a great underneath finishing (see photo). Source of leather is a top tannery in Vicenza (one of the two areas for quality leather in Italy) very soft and a superb touch. Stitched and upholstered by professional lab in Verona. Frame back made by a steam curved plywood then outlined for with a raising curve meeting a linear top. This chair does not have the circular cut at the arm rest like the other two. Brass feet and hand decorated ebony finished legs. See photos for details. Restauration grade finishing and upholstering. Natural brass ring fittings. Extremely comfortable and chic. 1960s Swedish armchair with birch frame, very comfortable with lumbar support and head rest. 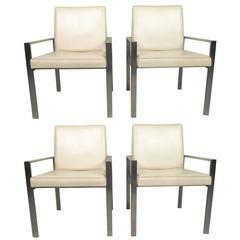 Set of six gilded metal and cognac leather dining armchairs: outstanding shape, comfortable, and trendy!